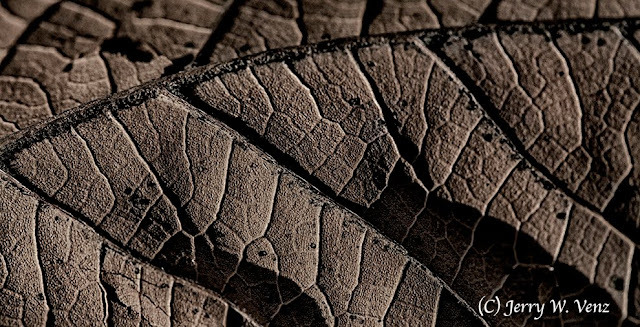 The Goboist: GOING IN CLOSE; MACRO PHOTOGRAPHY REVEALS MORE! One of my mottos has always been, “showing less can reveal more”. That’s why I prefer to use a telephoto zoom lens (instead of the wimpy 50mm prime, so many amateurs adore) when doing nature photography. I love to slice-up my subjects into tantalizing bite size pieces of yummy detail. Because it’s in the details that we can really learn the true nature of things. It’s in the details that we can witness the results of evolution or the hand of God—either way it’s awe inspiring to see it when I stumble across something as simple (?) as this dead leaf…. I found this decaying leaf in my front yard at the end of February. Somehow I missed it when I raked up the fall leaves and it remained intact, through our Idaho winter snows, frozen to the dormant grass. So, I let it dry out and photographed it in the cross light of the setting sun to clearly show its marvelous detail and texture. It was so fragile after it dried that I could barely touch it without its disintegration leaving me nothing to photograph. So, I decided to go in close and use my Canon EF 100mm, f2.8, Macro, USM, Lens to photograph the tallest part of the leaf where the light picked up the most detail; the part that had the least destruction from my handling! Macro photography is the ultimate expression of my “showing less can reveal more” motto; unless you start using a microscope—but that severely limits your subject choices! I prefer to use a true dedicated Macro Lens instead of extension tube(s) on a non-macro lens for this kind of photography. Why? When at 1:1 I don’t want to be too close to my subject. With the Canon 100mm Macro I’m no closer than 1 foot at 1:1. With extension tubes you can end up only inches from your subject, which can be detrimental to your direction of light. I want the highest optical quality and sharpness. The Canon Macro is extremely sharp Wide Open (@ f2.8) unlike most lenses and it’s designed to be sharp edge to edge as well. In addition the Canon 100mm Macro has an internal rear focusing element that eliminates any movement of the front element of the lens that is common with many lenses.